This modification will change the operation of the factory maplights (personal lights) on the 4th generation Toyota 4Runner so that they automatically turn on when any door is either unlocked by a key or keyless transmitter, or if any door is opened. 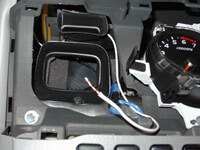 The standard feature that shuts the maplights off 30 minutes after they have been left on after the ignition is turned off will be retained to prevent battery drain. Additionally a switch will be added so that this mod can be turned off if so desired. 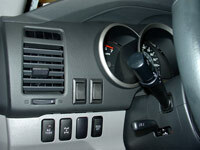 A switch will come in handy when working on the vehicle for long periods of time while repeatedly opening and closing the door, which will reset the 30 minute automatic dome relay power off feature. This mod requires that the Body ECU's ILE (Interior Light Enable) circuit be brought to an unused terminal on each of the two factory maplights. 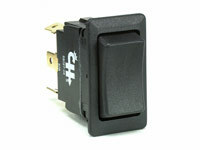 There are a few locations where the ILE circuit can be tapped into. You need to tap into only one. 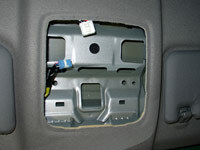 1) Interior Dome Light, pin #2, solid white wire. For those without a sunroof, you can tap into ILE here and snake the wire forward to the maplight. Since I want a dash mounted switch to be able to turn the maplight mod off as desired, it defeats the purpose of using this convenient tap in point. 2) 'A' Pillar roof wire bundle. 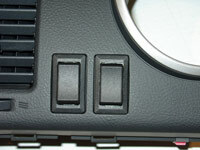 If you have a sunroof and don't want to add a dash mounted switch, you can make the ILE tap in here and not go through the process of opening the lower and upper portions of the dashboard. 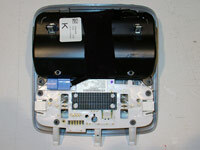 3) Driver side interior relay/junction box. 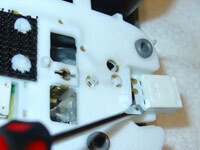 Front side, Roof wire harness connector 1A, Pin #8, solid white wire (note: there is more than one solid white wire within this connector). 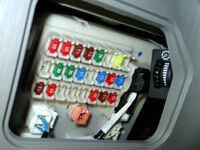 4) Driver side interior relay/junction box. Back side, Instrument panel wire harness connector 1K, Pin #9, red with green stripe wire. 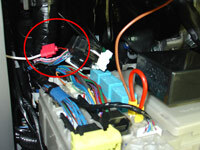 To maintain a factory appearance, make your tap into the ILE circuit back here and it will be less visible. I choose to tap into the ILE circuit using method #4. Remove front driver side 'A' Pillar trim. Using a screwdriver with the tip wrapped in tape to avoid scratches, remove the 2 assist grip plugs. Remove the 2 10mm bolts. 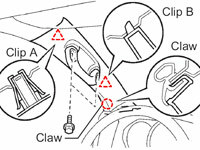 Using a screwdriver, disengage the claw. Pull to release two clips. Set pillar garnish aside. 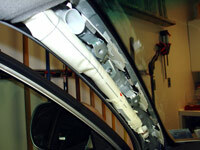 Remove roof console box assembly. Open the sunglass holder and grasp the interior of the box while using a screwdriver to pull down on the windshield side of the box. You will need to pull down very firmly to release the two clips here. 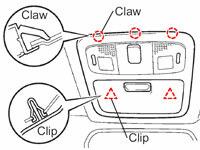 Once the clips release, pull the box towards the windshield to disengage the 3 claws. 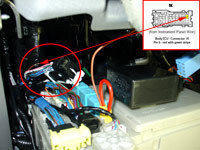 Disconnect the map light switch connector, the navigation microphone connector (if so equipped) and moon roof switch connector (if so equipped), remove the console box and set aside. 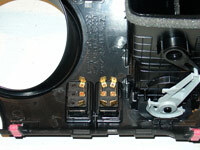 Use a small screwdriver to pry off the two factory maplight switches. 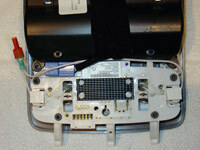 You will notice there are two prongs coming out of the console but three holes in the switch. Strip approx. 1/2" of the insulation off a section of 18 gauge wire and insert it into the unused switch input on each of the switches. Run these two sections of wire over to the left side of the roof console box. Splice them together. I used a blue 3M Nylon Fully Insulated Female Disconnect with insulation grip interlock barrel. Blue is typically for 16-14awg wire but works well when two 18awg are twisted together such as in this case. Good time for a test before going any further. 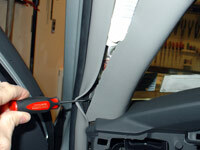 Open the hood of the vehicle and clip on a pair of test leads to the battery. Bring the ground wire to the wire you just added to the switches. With the maplight switches off, bring the positive (12V+) lead to pin #5 of the map light switch connector. The maplights should turn on (without depressing the switches). Using 18awg (American wire gauge) wire, and starting at the roof console area, snake the wire above the headliner and forward to the windshield. 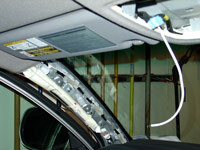 Pull it out of the headliner and across to the 'A' pillar. Leave it hanging out of the headliner for now. Run it down the 'A' pillar following the factory roof wire harness. Get the wire into the area where we will mount our switch. Now that we have the correct length for this wire, cut it from the spool and now go back and tape it in a few places within the 'A' pillar as well as push the wire up into the headliner where it runs from the roof console to the pillar. 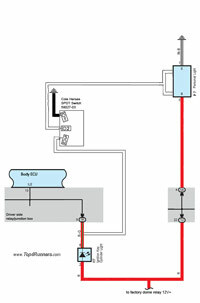 Tap into the factory ILE (Interior Light Enable) circuit. As mentioned above, there are a few places to tap into the ILE circuit. I am going with the back of the driver side interior relay/junction box, instrument panel wire harness connector 1K, Pin #9, red with green stripe wire. There are a couple of reasons for this. 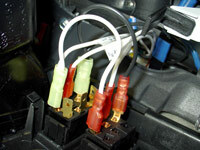 The ILE circuit wires available on the front side (Roof wire harness connector 1A, Pin #8, solid white wire) and in the 'A' pillar (which comes from Roof wire harness connector 1A) are ribbon wire type (multiple thin wires connected together in a ribbon) and are much harder to tap. Additionally making the tap on the back side is less visible and maintains a more factory appearance. I tapped into the ILE wire using a Red 3M Scotchlok 557 Electrical IDC (insulation displacement connection) connector which is perfect for 22-16 AWG solid or stranded wire. The ILE wire appears to be, in my estimation, 20awg. Run your wire from here up to where you will mount the dash switch. A switch is being added so that this mod can be turned off as needed. 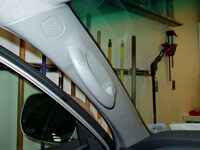 The switch will come in handy when working on the vehicle with a door open for extended periods of time. While the vehicle does have an automatic dome relay power off feature, which cuts power to the maplights (and dome lights) after 30 minutes of any door being left open, I still believe a switch will be useful. While any 12V on-off switch will do, I chose to go with a SPDT (single pole double throw) switch with on-off-on functionality. The primary reason for doing so was to match the look of the switch installed next to it, which is for my Footwell lighting mod. An added benefit of using a double throw switch is that I can wire one of the 'throws' (the up position in this case) to be an instant on mode. At this point we have already ran two wires to the switch location. The first was from the roof console and the second was from the ILE circuit. I crimped onto the end of each of these two wires, a red 3M Nylon Fully Insulated Female Disconnect with insulation grip interlock barrel. Red is typically used for 22-18awg wire. These disconnects fit quite tightly onto the switch prongs which is why I prefer the type that have a insulation grip interlock barrel. These type of connectors require a double crimping method, the first to secure the copper wire, the second on the wires insulation which further secures the wire. This helps to hold the wire securely in place when you need to pull on the disconnect to remove it from the switch, which can be at times difficult to remove. 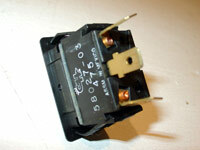 A dab of dielectric grease on the switch prong will help in any removal efforts as well. 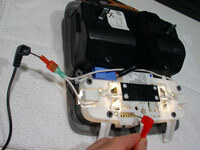 Connect the roof console wire to the center prong on the switch. Connect the ILE wire to the bottom prong on the switch. Now for the third and final wire to go to the switch. 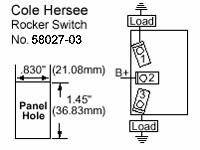 This is only needed because I am using a double throw switch. Using a 5" piece of 18awg wire (the black wire in my pics), use a ring terminal on one end and a quick disconnect on the other. Screw the ring terminal end to the screw that holds the driver side air vent to the dash reinforcement bar, this provides a constant ground source. Connect the other end to the upper switch prong. Up Position: Maplights turn on instantly (switch prongs 2-1 connected together). Center Position: Maplight Mod Off. Down Position: Maplights turn on (with fade feature) automatically when any door is either unlocked by a key or keyless transmitter, or if any door is opened (switch prongs 2-3 connected together). In the pics below, you can see the improved lighting in the front seat and dash areas with the maplight modification in use. 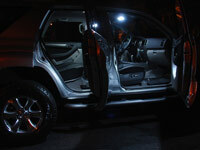 All lighting in these two pics are shown with Led Interior replacement bulbs. These pics were taken one right after the other with a consistent 1 second exposure with the camera mounted on a tripod.